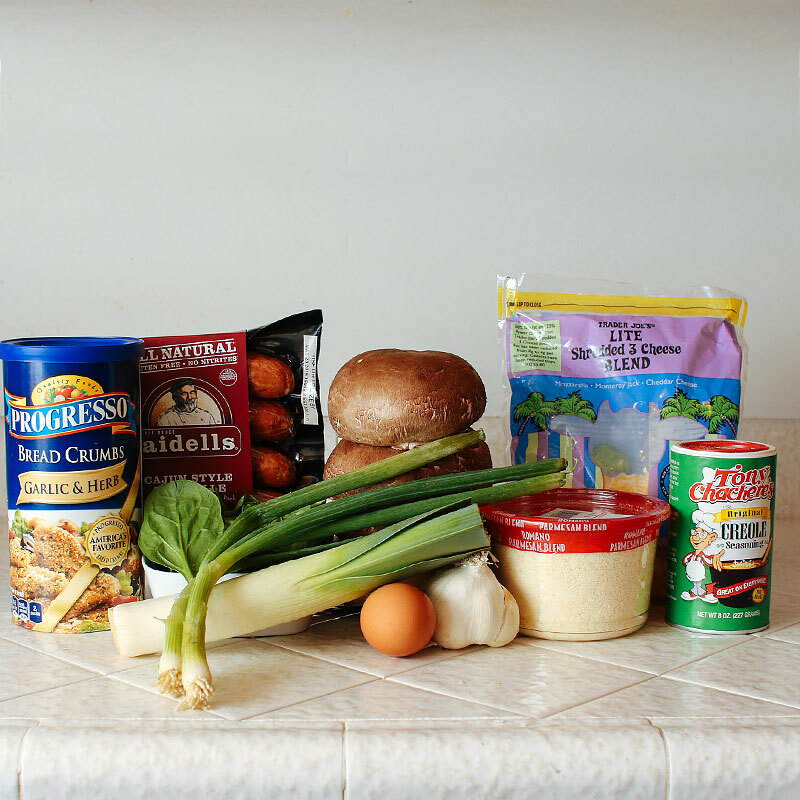 I’ve been trying to eat a bit healthier – which has actually been a blessing for the blog! I’ve been so uninspired lately. I’ve been overweight pretty much all of my life. I’ve tried pretty much every fad diet and pill known to man, but what everyone who’s ever lost a significant amount of weight will tell you – DIETS DON’T WORK; it needs to be a complete lifestyle change. And, I LOATHE the word diet. For me, mentally, it just screams “deprivation”. And I’m a food blogger – do you really expect me to DIET? I mean, the word starts with DIE and I might as well if I’m going to be limited in the foods I eat. The whole “eating clean / unseasoned chicken breast” life, I’m just not here for; especially as someone who basically cooks and eats for a living. Soooo, instead of the same old lame chicken breast and broccoli struggle plates that “eating healthy” usually entails, I’ve forced myself to get creative with the healthy stuff and to really start paying attention to what goes into my body. Going forward, you’ll see some additional information on my recipes, including nutritional information and substitutes (for those trying to cut back the calories and those that don’t care about calories at all); make sure you check the notes section below the recipe! 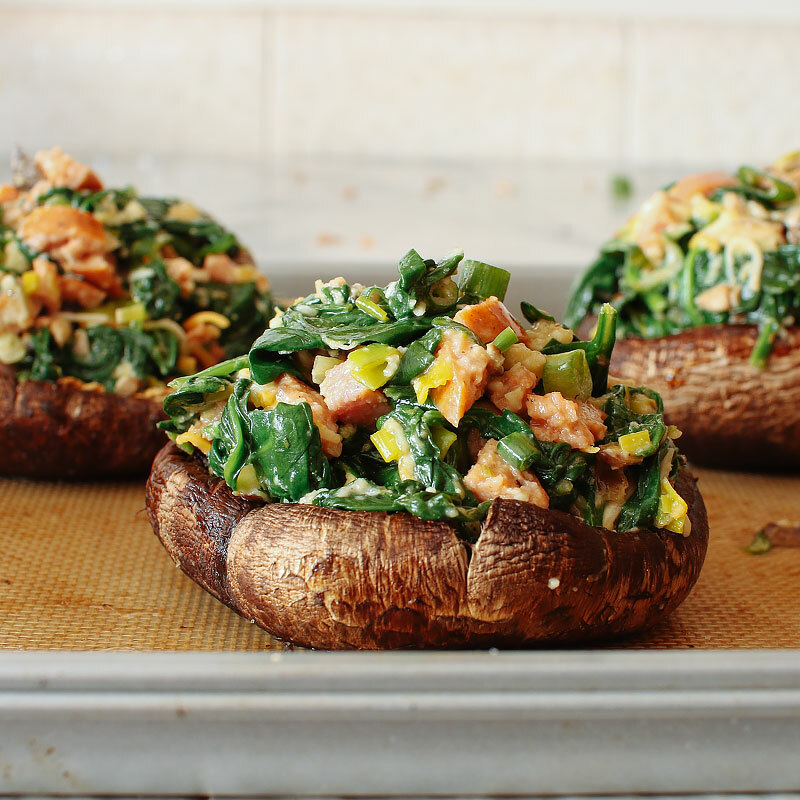 These mushrooms are EVERYTHING. Pair it with a salad and you have dinner! They come together quickly and you can easily substitute out the veggies and proteins for a quick dinner. No leeks? Use an onion. No spinach? Use kale! Don’t like andouille sausage? Use your favorite chopped up protein instead. Soooo. Many. Options. 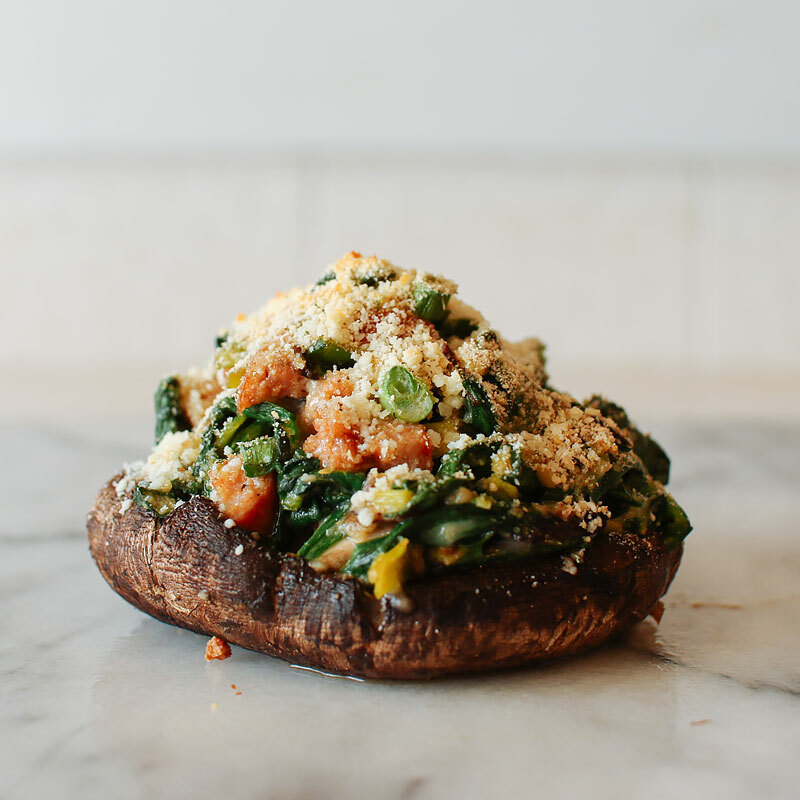 You’ll need bread crumbs, andouille sausage, portobello mushrooms, parmesan cheese, shredded cheese, creole seasoning, garlic, a leek, an egg, spinach and green onions. If your mushrooms aren’t already clean, remove the stems and use a spoon to remove the gills. Reserve the stems and chop them up to add to the filling. Season the mushrooms with salt and pepper and bake, gill side up, for 12 minutes @ 350F. 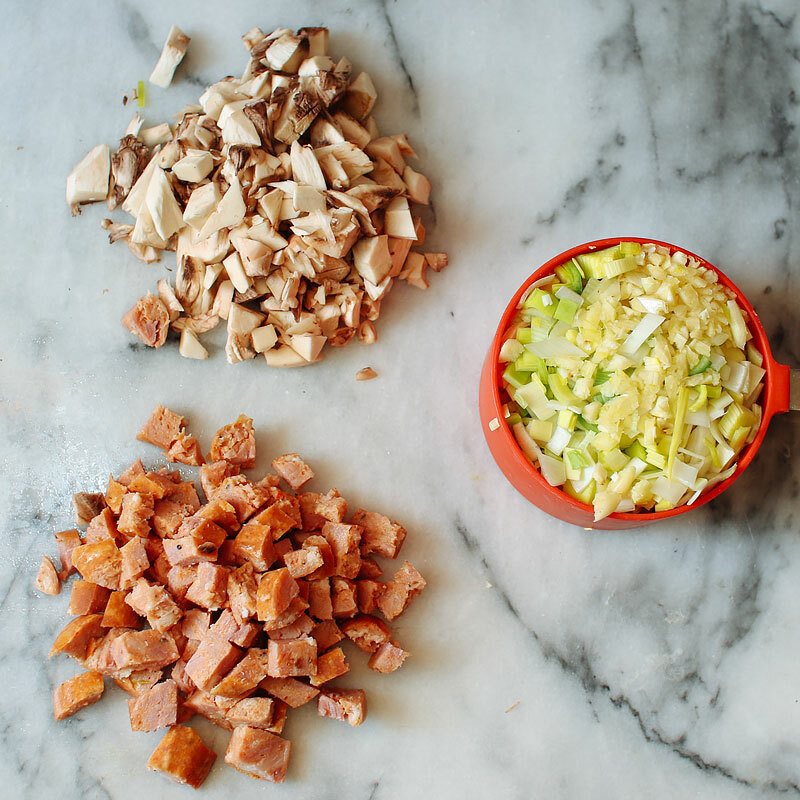 Chop your mushroom stems, leeks, garlic and sausage. Heat a large pan over medium heat and olive oil. Saute garlic and leeks for a few minutes. Add in creole seasoning and mix. Add in spinach, in batches if necessary, and cook until wilted. Add in the chopped mushroom stems here if you have them. 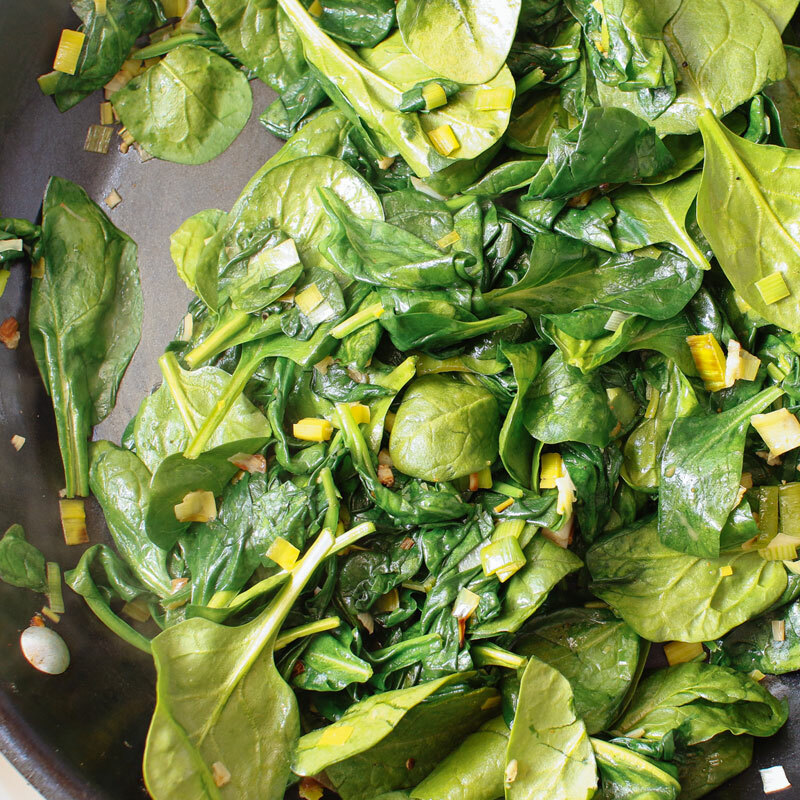 Cook the spinach just until wilted. Place the mixture in a medium bowl and let cool slightly. 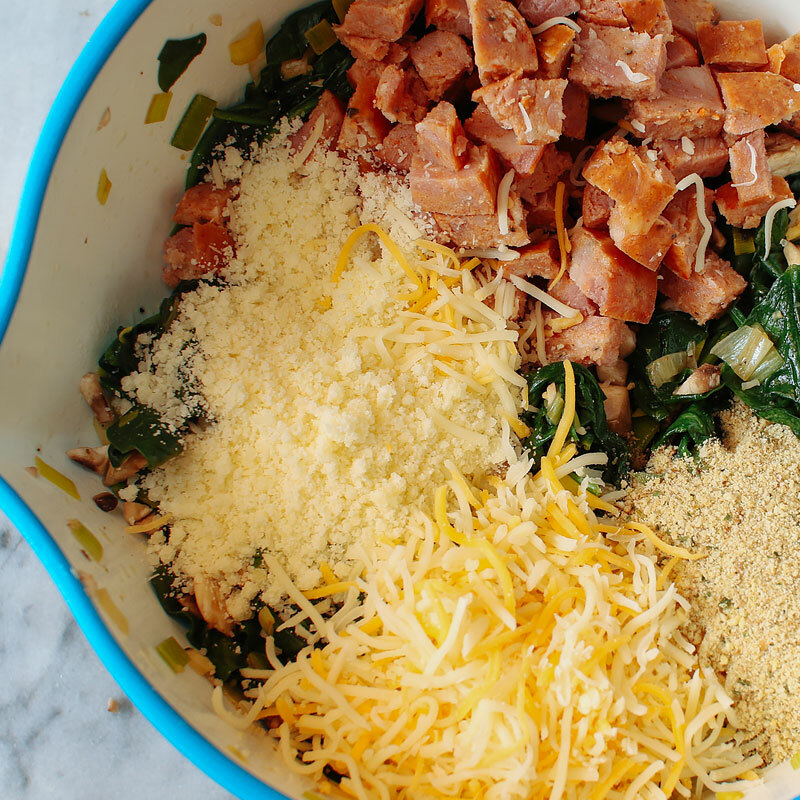 To the spinach mixture, add sausage, both cheeses and 2 tbsp of the breadcrumbs. Mix to combine and taste; adjust seasonings as needed. … and the beaten egg. 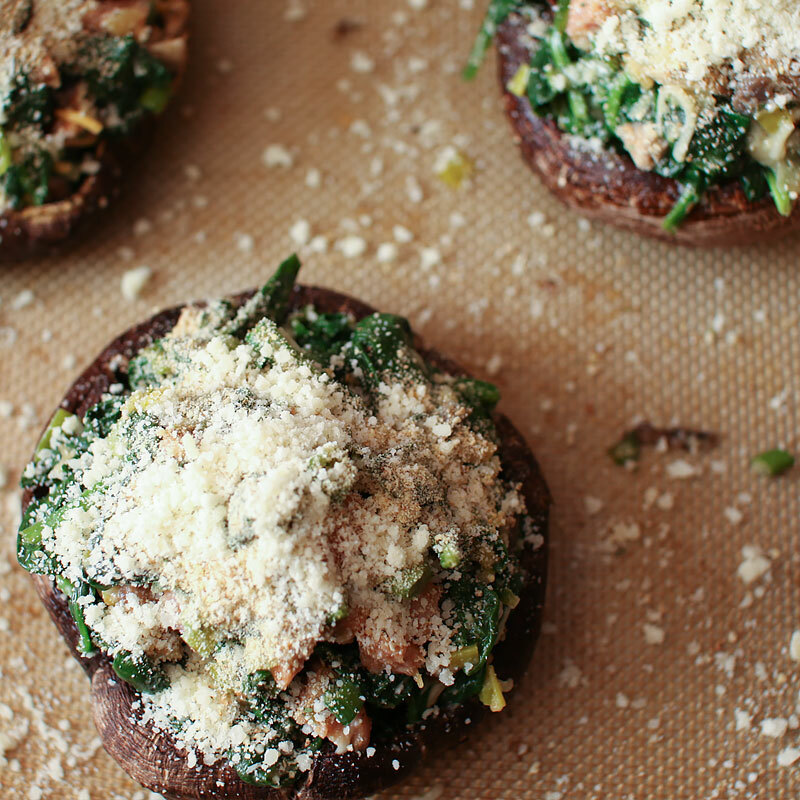 Drain off any liquid from the mushrooms that accumulated after baking, then stuff with spinach mixture. 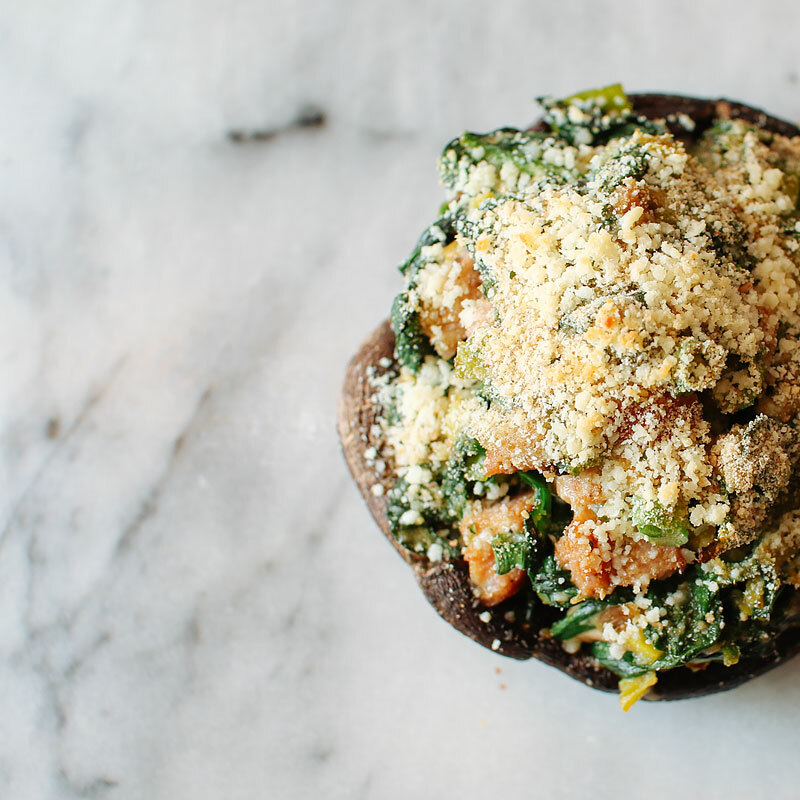 Top each mushroom with the remaining 1 tbsp of breadcrumbs and an additional 1 tbsp parmesan cheese if desired. Bake for 10 minutes, until warmed through and topping is browned. Ta-da! 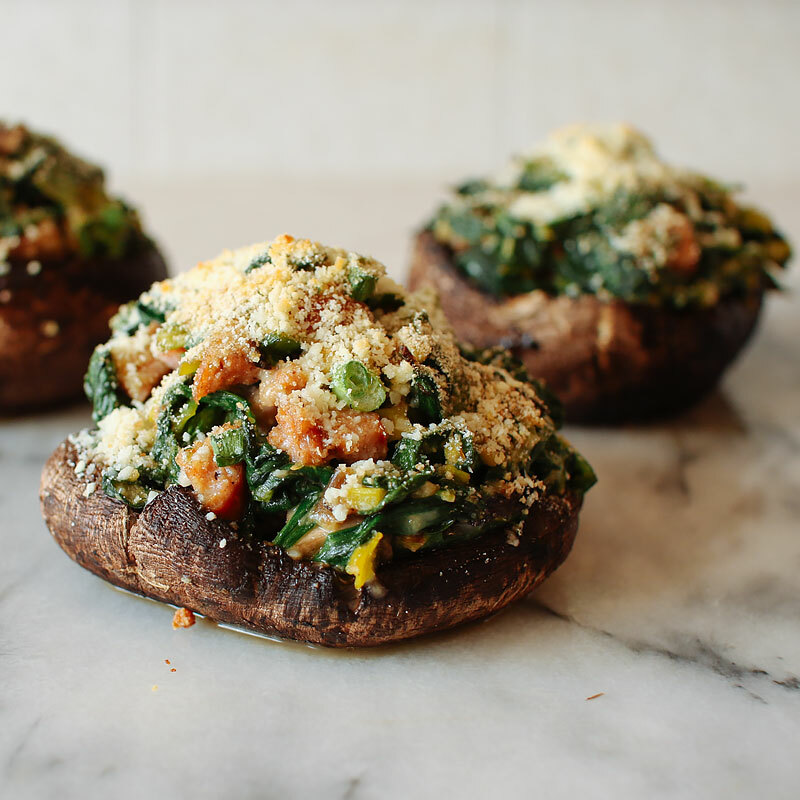 Spinach and andouille stuffed mushrooms! Browned crispy topping is the bestest. Portobello mushroom caps, stuffed with spinach, cheese and andouille sausage. 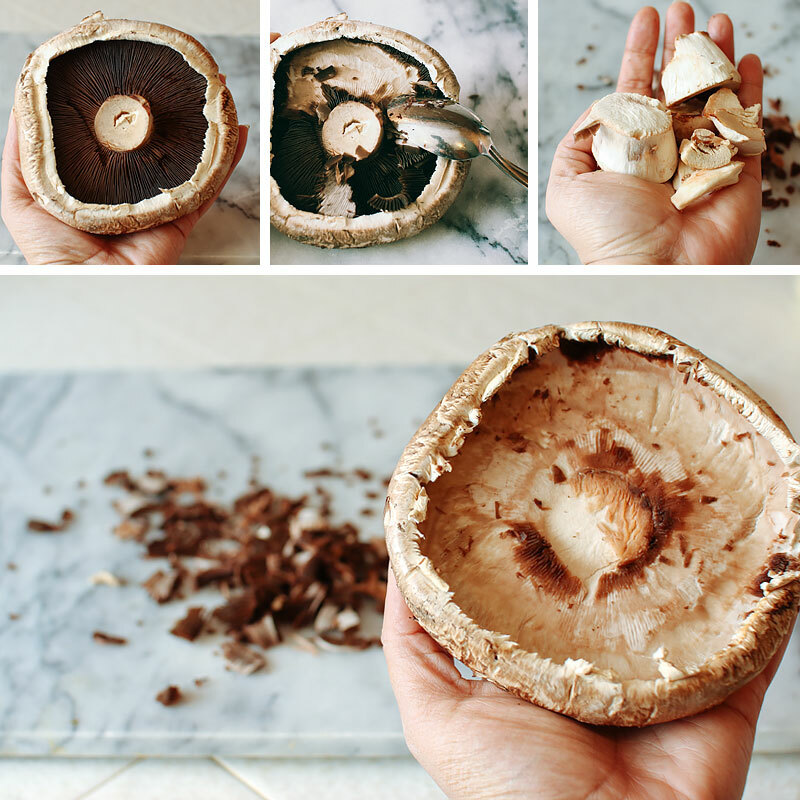 Clean your mushrooms by using a spoon to remove the gills. 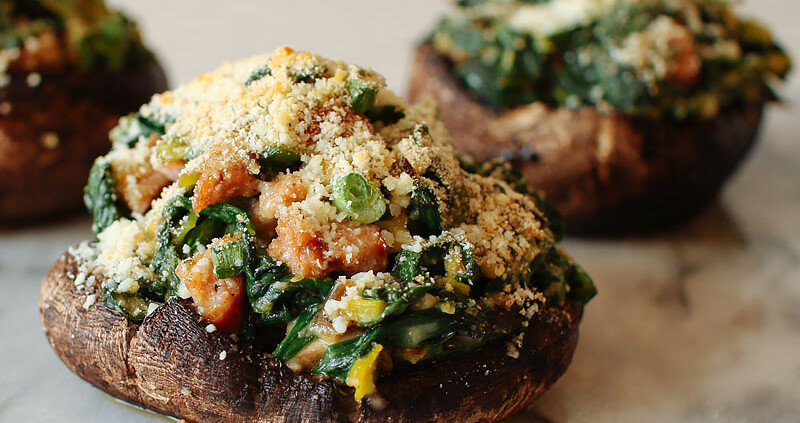 If you like, save any portobello stems, chop them up and add them to the spinach filling. Season mushroom caps with salt and pepper and place gill-side up on a baking sheet. Bake for 12 minutes, until tender. Mushrooms tend to give off a lot of water, so make sure to drain any liquid from the caps and the baking sheet. While the mushrooms are baking, heat a large skillet over medium heat and add in olive oil. Saute leeks and garlic for a few minutes. Add in creole seasoning (or seasoning of your choice). Add in the spinach - it probably won’t all fit into the pan at once, so add it in batches. 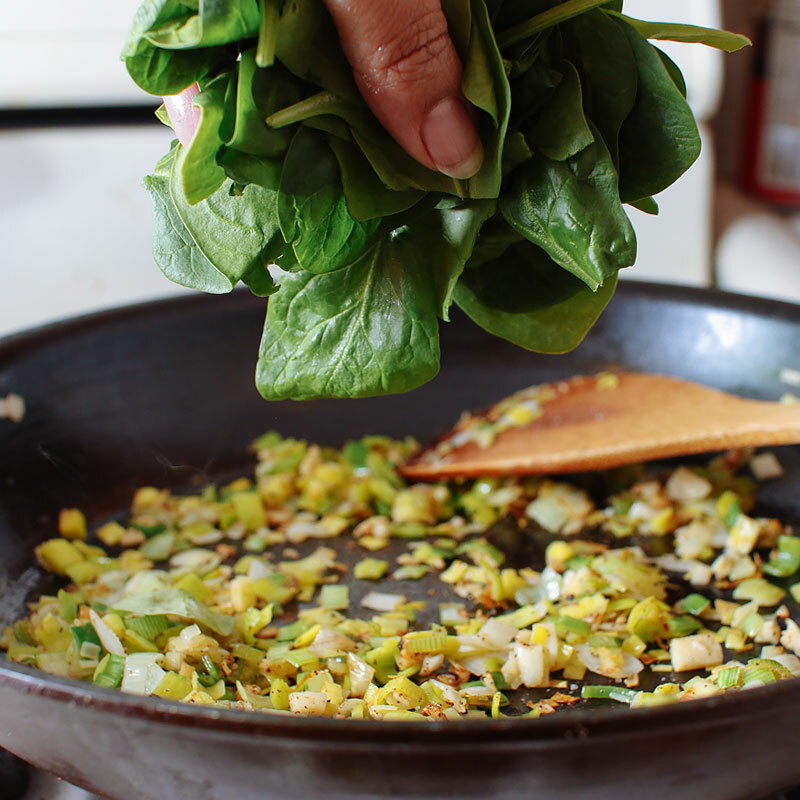 Cook until all the spinach is wilted. You can also add in any chopped mushroom stems from cleaning your portobellos at this point. Place in a bowl and let cool slightly. In a small bowl, beat egg and season with salt and pepper. 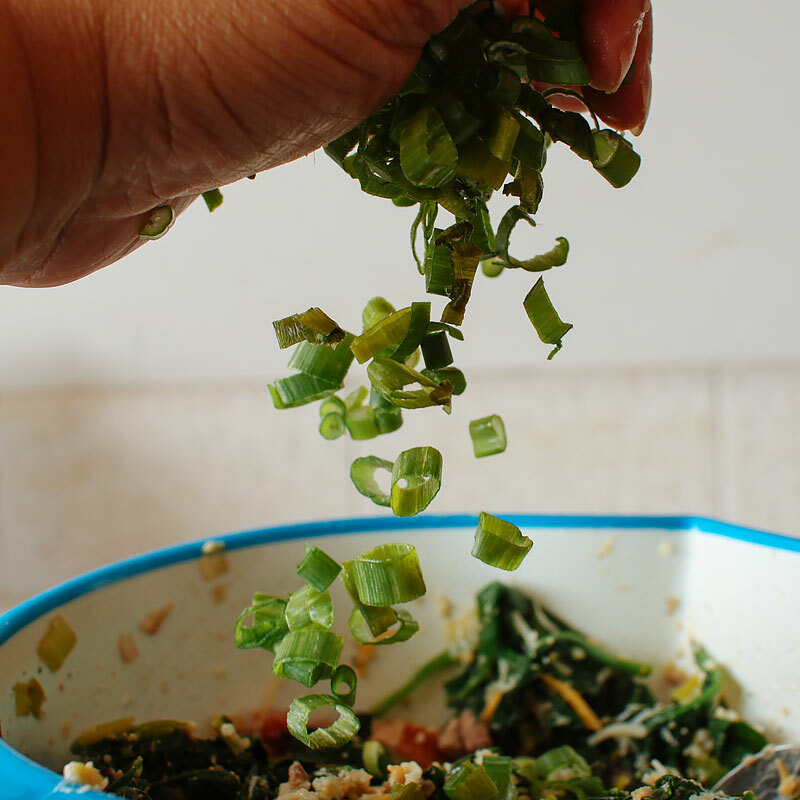 Add the chopped andouille sausage, Parmesan cheese, shredded cheese, green onions and 2 tbsp of breadcrumbs to the spinach mixture and stir to combine. Taste and adjust seasoning as needed. Add in the beaten egg and mix. Divide the spinach mixture between the 4 mushroom caps. 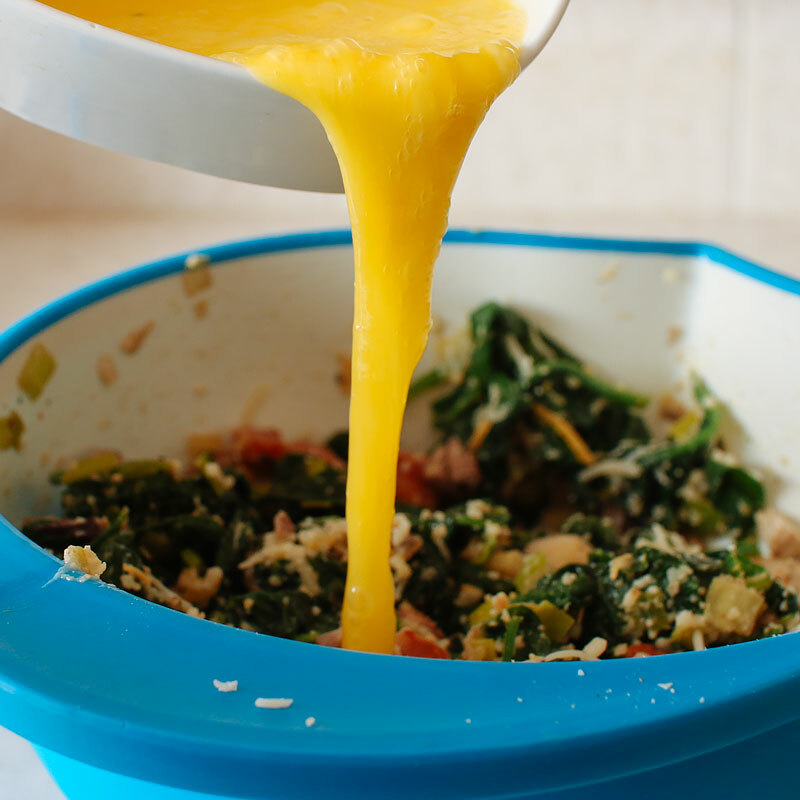 Sprinkle the tops of each cap with remaining 1/4 cup of cheese and 1 tbsp of breadcrumbs. Bake an additional 10 minutes, until filling is warmed through and cheese is nice and melty. Nutritional information based on recipe above. Using any of the substitutions below will result in different nutritional values. For the andouille, you can substitute any protein you'd like, add more protein or leave it out completely and make this a vegetarian dish. For the cheese, feel free to use your favorite shredded cheese - it doesn't have to be "light", I'm just outchea tryna cut some calories! Mozzarella is great! Mm great idea! A wonderful way to end a productive day!